She's supported Bryan Adams and Red Hot Chili Peppers and fronted a rock/pop band but Jill Jackson is definitely her own woman. Currently promoting her new solo album 'Getaway Driver' and accompanying tour, Jill took some time out to speak to rucomingout about her music, her influences and what it's like being a gay role model. Congratulations on the new album ‘Getaway Driver’. What’s the concept behind it and how is the title significant? "The title of the album shows that there is an edgy/quirky side to my music. All of the songs are very personal but obviously Getaway Driver isn’t based on a personal experience as I’ve never robbed a bank… just dreamt of it. The album shows every side of me which is why I think it’s my strongest album yet." You have a very busy year ahead with appearances planned for GoGo Festival, L Fest, L Beach Festival as well as your own UK tour. Do you get nervous when performing your songs, some of which touch on very personal experiences? "I always get nervous, sometimes too nervous! It’s hard when you are up on stage singing about things that are very personal, you feel so exposed, like you’re turning yourself inside out in front of hundreds of people but I also love it." How does writing and touring as a solo artist compare to your time in Speedway? Do you feel the music you write now can be more personal? "I had an amazing time with Speedway but I am much happier where I’m at now as a singer, writer and performer. Being with Speedway was all very controlled, I had no freedom to do what I wanted musically. Now I can go in the musical direction I’ve always wanted and I can write about personal experiences instead of writing generic pop songs." One of the main aims of our website is to inspire people to come out despite the possibility that the process might not go as smoothly as they hope. How was coming out for you? Was it a positive experience? "It was a difficult experience for me. The tabloids found out I was gay and contacted me to say they were going to run a story… I had to then tell my parents which was quite scary. I don’t know why I was so worried about telling my family because they were amazing, they even threw me a party called the “As if we didn’t know” party. I’m very lucky that they were so understanding but I didn’t like that I didn’t have a choice about when I told them. All my friends, family and fans were very supportive and thankfully none of the press that surrounded me being gay was ever negative." Melissa Etheridge has said that coming out did wonders for her career. Does being open about your sexuality help you as an artist and performer? "Personally I don’t think about it much other than that I can just be myself, like writing songs that mention girls rather than boys." Were there any lesbian role models you looked up to when you were growing up either in the music industry or anywhere else? "I always looked up to Dolly Parton… she’s my hero and I’ll throw a party when she comes out!" The inclusion of your track ‘Just Not Myself’ in the BBC Three series Lip Service led to you touring with Heather Peace. Do you have any plans of working with Heather again in the future? "It was great fun touring with Heather but at the moment we are both very focused on our own projects so there are no plans work together." Do you think that gay singer-songwriters struggle to break into the mainstream and what is your opinion on artists (and other well known figures) remaining in the closet to protect their commercial success? Do they have a wider responsibility to the gay community to be out? "I can see why some people stay in the closet for the sake of their careers but I also think it’s very sad that people can’t be themselves. It takes courage but I think I respect people more when they are true to themselves. I think it’s different if you’re an actor/actress because it may affect roles but in the music industry I think to be a true artist you have to be honest." A little birdie told us that you’re a badminton marvel! Do you still get time to play? "I play sometimes with one of my school buddies. I still have my trophies but I’d prefer to play football. To be honest I’ve stopped playing as I am tired of losing against my Manager." Whose coming out story would you be interested in reading on rucomingout? 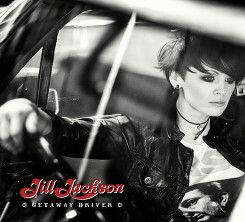 Jill's album 'Getaway Driver' is out now!